It's well suited for an all-in-one concept to build business relationships and manage contacts across a company, whether it's candidate management or prospect/client management. It's less useful if a company holds different licenses from different divisions where neither can see each other's prospects/clients, which was the case when I was using Bullhorn at my previous company. I have been using it for the last four years and in most of the cases it worked amazing. There is no such scenario where it was like less appropriate. I would really like reporting and hot list features. It helps me to save a lot of time and effort. Moreover, There are such instances where my company need to fetch the data of hires and it works amazingly well. Most importantly, Bullhorn Recruitment CRM and Outlook were able to communicate, so for example, if a candidate sent a resume in an email via Outlook, we were able to directly parse the CV in Bullhorn and create the candidate's profile. Another interesting feature is that we are able to parse LinkedIn profiles to get a candidate's details. This is actually interesting if you want the candidate created in Bullhorn while you wait for the actual resume. Once you get the actual CV you can directly link it to the candidate who's already created. You don't need to save the CV and then add it. When it comes to client management; Bullhorn Recruitment CRM allows you to create one company and add as many contacts as you wish. You can add notes to each individual contact, create follow-up tasks and even send calendar invites via Bullhorn is you are using the email feature. JobDiva has excellent integration with outside tools. For example it syncs with Outlook and Google Calendar. We also use a text messaging tool called TextUs and it is totally seamless and painless to set up. JobDiva continuously adds new features to help our organization. Even small changes can make a world of difference! For example, it indicates for us when a candidate has "opened" one of our email merges! So we know when a candidate has read our email but has not replied or responded to our communications. It allows us to create Hotlists so we can build better pipelines of candidates. Templates are also easy to create in JobDiva! We can customize messages and communications that we send out to candidates and workers. Although the direct candidate parsing feature is great, until you have the candidate in the Bullhorn system with their email address, the email communication won't sync up even after you enter the email address. It is simply moving froward from the time the email address was input. MaxHire Solutions was acquired by Bullhorn. They have this feature where you can immediately parse via a plug-in a candidate from LinkedIn and create their profile prior to them sending you their resume. This is effective because of candidate ownership. It shows your colleagues and others using the Bullhorn system that you've started communication with a specific candidate and makes it easier to track how many contacts you've had in a given week. Perhaps one feature they can work on is the ability to do an e-interview. With so many clients and candidates nationwide, we are not able to meet with every individual in person. It would be nice to have a web camera feature where we can conduct a video interview with pre-qualifying questions. This can be used for screening purposes or as a supplement to the resume that we send over to the Hiring Manager. We would also need a way for these video files to be saved and stored in the candidate's profile. It is an spotty CRM/ATS with bad reporting and the support is terrible. Because of the recent price increase, we are mandated to remain on the lookout for evolving and improved similar platforms that may be more cost effective over time. We are renewing it every time because it is our main source engine for resumes which we get requirements from clients. As it is also cheapest in price and excellent in providing multiple features at low cost we will renew this again and again. We will use this for a long time. Has more features than most trackers but they are difficult to navigate and locate. Recent problems with system availbility. We can think of no dissatisfaction with our daily use of iCims, involving its response time to commands or incompatibility with any other software we presently use. They don't care, they want you off the phone, and you have to talk to multiple people where you repeat your problem again and again before they tell you they will call you back. They never will call you back, so you'll call the next day & repeat the cycle until you finally shame someone into fixing your problem or threaten them with legal action due to breach of contract. Recent issues with responding to request. Lack of resolution in the first contact. If any time I find an issue with job diva they fix it after few minutes of its reporting. iCims has always been available and helpful with much live and online training offered. mNot at this time it went smoothly. 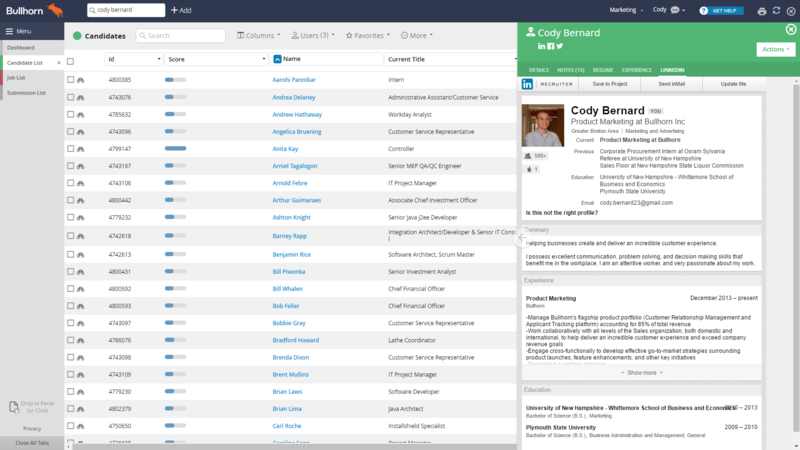 Bullhorn has a complete integrated feature where it speaks with Outlook; makes parsing candidates who submit their data and resume simple. This is effective when you are running a 360 desk as it saves time and helps you focus on prospecting for clients and candidates. Often times when the software is hard to navigate through or requires many steps to complete one entry, it becomes discouraging and you're less eager to enter the data properly. There is almost no comparison between Taleo Business Edition and iCIMS. iCIMS has a better product, that provides easier self service and a better support team when dealing with issues. Our biggest reason for leaving Taleo was because the support availability had become so poor. In order to have anything changed or addressed you had to call in, describe the issue, then it was ranked, and someone called you back in 1-5 business days. Any issue with iCIMS is typically handled on the first phone call. The more attentive customer service was the primary reason we made a switch. As compared to eRecruit, JobDiva is very friendly. For two years I used JobDiva and eRecruit simultaneously but by comparison JobDiva is very quick and user-friendly. On the other eRecruit is very slow, very very slow, Hangs a lot. Sometimes it becomes very difficult to even see the resumes or to track the reports. iCims is currently pretty good and the best TAS for us at our stage of growth - but further improvement and enhancements will only help make it even better. Unfortunately it's had a negative impact on our business, the on-boarding / training was spread out over 6 weeks and the initial transition to Bullhorn was 'painful'. Even now, after 4 months, I would say that we are probably worse off than when using our previous system. For a system that is supposed to be one of the best (and we know is used by some very large recruitment companies), we were surprised at how poor some of the features are. The support team are all very nice, but they struggle to get some things done as it's the engineering team that actually make most changes. The issue we had with the LinkedIn feature resulted in us being told that the only option was for us to take it up with LinkedIn directly, which is a bit of a joke in my opinion. The LinkedIn feature was one of the reasons we decided to go with Bullhorn, so it has caused us some frustration and annoyance. The added use of a position management function has help management determine where there headcount is in the process of hire/fire at any given point in time. an improved recruiting workflow has given our recruiters a precise view into there req load and the status of there candidates allowing them to handle more reqs with no added effort. A great candidate application process has lead to less "dropped" candidates and an increase in our candidate database. This has improved our sourcing efforts dramatically.